HYUNDAI Group is not only one of the five largest corporations in South Korea, but also one of the 100 top groups in the world. Zheng Zhouyong, the founder of HYUNDAI, has founded HYUNDAI Automobile, HYUNDAI Civil, HYUNDAI Engineering, HYUNDAI Construction Company from 1946 to 1951. In the 70s he also has establish HYUNDAI Heavy Industry Company. Therefore, HYUNDAI is a comprehensive enterprise group engaged in construction, shipbuilding, automobile industry, steel, machinery, trade, transportation, cement production, metallurgy, financial, electronic industry and other industries. 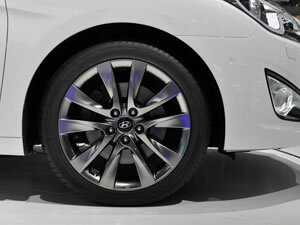 HYUNDAI steel wheel rim adopts disc brake. After this process, the hand brake is added to the car. Meanwhile, the spare tyres size is optional for our consumers. Wuxi Hengsheng Wheel Co., Ltd is a professional HYUNDAI wheel rim manufacturer and supplier in China. In addition to HYUNDAI wheel rim, we also provide other famous models steel wheels (rims) for our clients around the world, like Acura wheel rim, Audi wheel (rim), BMW wheel (rim), Ford wheel (rim for Mercury), Buick wheels (rims), Cadillac wheel (rim), Chevrolet (GMC) wheels, Chrysler (DODG, PLYMOUTH) steel wheels (rims), Daewoo wheel (rim), etc. We possess a professional technology team to guarantee the manufacturing of HYUNDAI steel wheel rim. We will checkout all the products and give out a survey report. According to the needs of every client, there will be a dynamic balance sample survey among parts of the qualified HYUNDAI steel wheel rim.